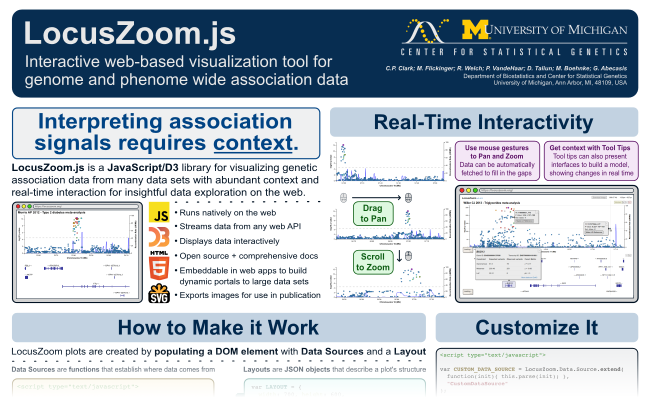 LocusZoom is a suite of tools to provide fast visualization of GWAS results for research and publication. Original LocusZoom (R/Python) is ideal for batch generation of static plots. We have recently been working on ways to simplify generating an interactive plot with your own data, using only a web browser, without the need for a server. Our "LocalZoom" tool is the first visible step in this process- it is currently in beta, but can be helpful for exploratory analysis. Optionally annotate the plot with calculated 95% credible set (based on the data shown on the screen) and SNPs found in the EBI GWAS catalog. The credible set calculation results can be exported as table / CSV. Jump to region box: enter a region (10:114550452-115067678), or search by rsid/ gene name (exact match). The plot defaults to a region near the first few rows of your data. This tool only fetches the data needed for a single Locus at a time. It does not do anything that requires summarizing the entire dataset (eg manhattan plot). Your input file must contain all the data required to make the plot: chrom/pos/ref/alt/(log)pvalue. The tool does not work with rsids. You must manually select the build for your data. It does not auto-detect the build. Some features are very much in beta- feedback and bug reports are highly welcome! It will try to auto-detect file columns, though you will often have better results selecting columns manually. The "load from URL" button requires that the server support both CORS and byte-range requests. Not all servers do this. Because the data stays on your computer, this tool does not provide a way to share a link with colleagues. With its latest release (v0.4.8), LocusZoom.js now has built-in support for display of annotation/BED tracks. You can also see and work with annotation track data now on the Interactive Plot page. The poster will be located at 1829T in the Bioinformatics and Computational Approaches section. See and download the full resolution PDF of the poster here. If you find yourself at ASHG this October please stop by! The poster session will be from 2PM-3PM on Thursday, October 20. Recently the UM/CSG team began work on LocusZoom.js, a way of making LocusZoom embeddable and interactive. Being built for the web, interaction with the new LocusZoom.js is fundamentally different from how you would interact with Original LocusZoom (built in Python and R for command-line operation). To see for yourself begin by interactively plotting published GWAS results. 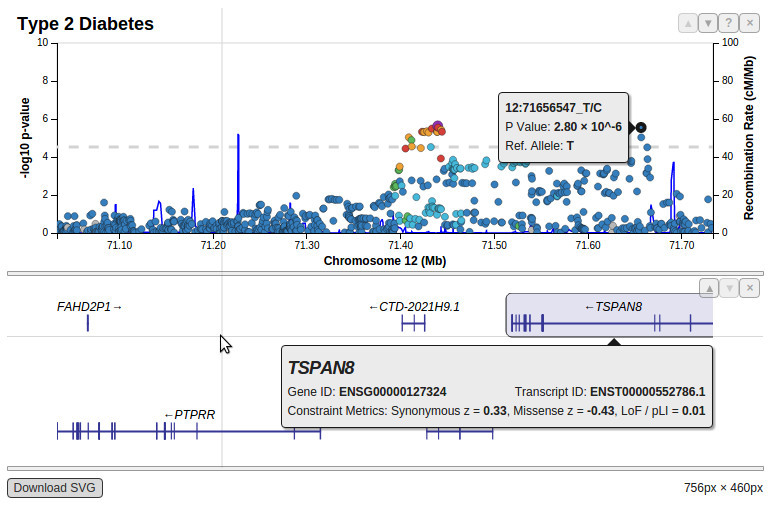 Add arbitrarily many studies and navigate around the genome with your mouse. LocusZoom.js has not yet been hooked up to a form to upload your data here on this website, but it is open source and heavily documented so you can build your own applications with it. See the documentation and get the source code to get started! The original LocusZoom (Python/R) for generating single/batch plots of your data or single plots of published GWAS datais still available here and will continue to be. Please tell us what you think! Post your questions and feedback on the LocusZoom Message Board. We are pleased to announce that our paper on LocusZoom has been published! Reference: Pruim RJ*, Welch RP*, Sanna S, Teslovich TM, Chines PS, Gliedt TP, Boehnke M, Abecasis GR, Willer CJ. (2010) LocusZoom: Regional visualization of genome-wide association scan results. Bioinformatics 2010 September 15; 26(18): 2336.2337.